Barbara Takenaga: The Edge, 2018, Acrylic on linen. 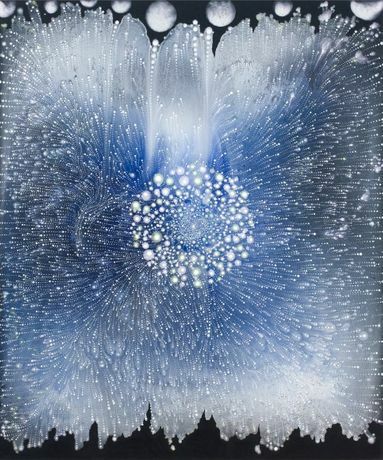 DC Moore Gallery is pleased to present Outset, an exhibition of new paintings by Barbara Takenaga, the artist’s fifth at the gallery. The exhibition is accompanied by an illustrated catalog with an essay, “On Systems of Radiance” by art critic Lilly Wei. Manifold (2018), a sprawling and luminous five-panel painting, its construction reminiscent of Japanese Byōbu folding screens, anchors the show. Dominated by an elegant swoop of black space emanating from a silvery background, the work is flecked by dozens of spout-like shapes that suggest diminutive geysers, or perhaps flickering candlesticks. The gossamer forms resist literal interpretation just as they resist being pulled into the void of black. The vacuum itself in turn unfurls asymmetrically, as Takenaga creates a tensional push-and-pull across the panels. Close scrutiny of the painting reveals a scrupulous, scallop-shaped pattern ebbing through the dark expanses of paint. The detail reflects how the artist is an advocate of the Pattern & Decoration movement of the 1970s just as much as it does her interest in the organic, the repeated markings like the ordered scales of a fish. Manifold is simultaneously indicative of the infinite expanse of the universe, and also the earthbound mysteries of our own world.